AE1S Amateur Radio Blog: "Say Hello to my little friend!" Update: If you are looking to buy an Antenna Launcher for Field Day, please check this post. Tony Montana's famous words as the answer to the question: How do you get an antenna rope over a 100+ ft tree-top? Forget about slingshots or bow and arrows. Even the crossbow with optical sight is so last century :). Enter: the pneumatic antenna launcher or shall I say "pneumatic blunderbuss";-) Here is the result of a couple of evenings spent in the garage - cutting, gluing and painting PVC pipes. This antenna launcher is based on (WB6ZQZ) Alan Biocca's CSV19 with some modifications / improvements on my part. His web site (http://www.antennalaunchers.com/) is an excellent source of information on these launchers and it has very detailed build instructions. I had to do something about the white PVC look which I REALLY hate! The paint job was inspired by K4ICY and his "Steampunk" antenna launcher. - Slightly larger compressed air tank - my launcher is using 10 inch length of the 4" diameter pipe for the tank vs. Alan's 8 inches. The reducing coupler I am using as part of the tank gives a little extra volume too. - Longer barrel - 18.5 inches vs. Alan's 16 inch barrel - I had lengthen the barrel a bit in order to account for the larger pressure vessel and have enough clearance for the Zip Reel. -More reliable and safer pressure vessel - instead of drilling a hole for 1" pipe and epoxy gluing the pipe for the high pressure outlet in a 4" end cap, I am using a 4" to 2" reducing coupler and and 2" to 1" reducing bushing as part of my pressure vessel. Another advantage is that I don't have to drill precision large diameter hole - unfortunately I don't have a lathe. -I made the spacer between the pressure tank and the barrel out of two pieces PVC, sliced from 4" pipe scrap. I adjusted the curvature of each piece to follow the outside diameter of the corresponding pipe and glued the pieces back-to-back. The main source of PVC hardware for this project was http://flexpvc.com/. Trigger, pressure gauge and Schrader valve are available from McMaster (the trigger is part 6852K11). Rainbird 100DV-SS sprinkler valve is from eBay. The bow-fishing zip reel is from an online archery store. Brass fittings, brass street elbow and aluminum stock (for the Zip reel mount and support strut) - all from Home Depot. Tennis balls and Spectra line (150 yards spool / 50 lb test) from Sports Authority. For all threaded connections (sprinkler valve to trigger valve, pressure gauge, Schrader valve) one should use the yellow type teflon tape - it is made specifically for gas/high-pressure applications and seals much better than the standard white plumber's tape.I hated the rattling sound of the coins (used to bring the weight to 4 oz) inside the tennis balls so I injected the balls with polyurethane foam (used to fill gaps). For the tennis ball tie, I used a loop of string with a knot, drilled a penny right in the center and inserted the loop thru the hole. The knot should be large enough so it cant go through the hole. Then I inserted the penny vertically in the tennis ball thru the narrow slit I previously made. When I pull on the loop, the penny wedges flat across the slit - this solution works just fine and after I filled the ball with foam there was no need to stitch the slit - the foam glued the slit and the pennies inside. This picture shows the installation of the Saunders Bowfishing Zip Reel. Two aluminum bars are attached to the zip reel and the 2.5" coupler is mounted in the center with countersunk screws. (the bottom side of the coupler was filed flat to form two "saddles" for the mounting bars). It is loaded with 150 yards of high-visibility Spectra-Line (50lb test). I even installed a little cutting blade (the yellow thing on the bottom) for added convenience. This line cutter was part of the Spectra Line packaging - i just had to cut it out from the plastic spool-holder. Update: In the original design the trigger valve could loosen or over-tighten if one is not careful - the valve is not fixed - it relies entirely on the thread and because it must not go all the way in (the street elbow is just partially threaded, 2-3 turns max), accidentally rotating the valve in either direction could cause a variety of unwanted effects. Alan, WB6ZQZ suggested to use a strut to support the trigger so this is what I came up with. Small piece of curved PVC (scrap 4" pipe, heat gun, 2.5" pipe used as a form for bending and sanding) is drilled for a countersunk screw then glued to the barrel with the screw in place to create an anchor point. An aluminum bar is used as a strut between the anchor point and a brass trigger outlet extension. The red cable-tie is the "safety" (currently in ON position) - it prevents accidental operation of the trigger. Another solution for the strut anchor point is to drill, countersink and install the screw from inside of the 2.5" to 2" coupler BEFORE the 2.5" barrel pipe is glued. The hole for the screw should be drilled in the middle (or closer to the edge) of the 2.5" portion of the coupler and the countersinking should be deep enough to allow for smooth installation of the barrel after the screw is inserted. There is not much clearance for right-angle drill -the countersink can be done with RA Dremel attachment or manually by hand. There are videos of pneumatic launchers in use on YouTube. IMHO the effect of the video is lost as it is difficult to track the ball in flight and get an idea from the video about the height of the trajectory. PVC and compressed air = recipe for disaster. Stay safe people. I have de-rated the whole system down to 100 PSI (this is also the limit of my pressure gauge) which is less than a half of the maximum allowed pressure for the weakest pipe. Furthermore, there is no practical need for using more than 80 PSI. There is an initial pressure test procedure, (listed on Alan's site) which must be completed. I agree that compressed air is no joke and one should be very careful when building, testing and using such device. 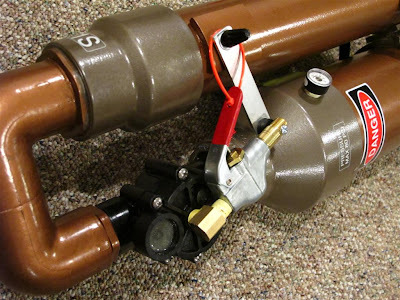 Love your "Little Friend" building one just like it; except using a Class 200 2.5 inch barrel (same internal deminsions of an SDR 21 barrel (or very close) and rated for 200PSI) not so tight on the tennis ball...oh & a K-Rain valve. I've seen 4" Sch 40 pipe that is labelled "NOT FOR PRESSURE". I've also seen 4" Sch 40 pipe that is labelled "220 psi". There's a big difference in the density and weight. Easiest is to make sure you read the fine print. "NOT FOR PRESSURE" is the foam core pipe I mentioned in a previous comment. This type pipe is used for drain and waste waste water and it can not take any pressure - it is PVC with foam filler - very lightweight too. It is commonly sold in Home Depot. Stay away from such pipe! One must use ONLY pipe with pressure rating for such device. Did you actually design the AR Scope application or did you just happen to find it? I love the look of this and the notes off improvements over Alan wonderful earlier design. Yes, this is even more safe! Q: What type paint did you use? Q: Is there a sprinkler valve that allows one to remove a selonoid from the center and then use those threads? Q: Would you consider a threaded valve? A: I used spray paint - KRYLON Fusion. It is specifically designed for painting plastic. You can also apply a VERY thin coat of the purple PVC glue primer and wait to dry before applying the paint. This will make the bond with the paint even stronger. Just keep in mind that after applying the primer, the surface of the PVC will become tacky and can pick up dust and particles before painting it. Test the process with scrap piece of pipe beforehand. A: The problem with using the solenoid socket is that you have to come up with adapter for your secondary (trigger) valve. The socket tread is too short so you have to address possible leak there. Furthermore, the original hole is too small for rapid enough venting. It is important that the valve opens fast enough and you have to have an adequate airflow thru the trigger valve for this. (and you still need to close the second hole in the solenoid socket). Drill and tap works fine if you are careful. Just use the YELLOW teflon tape (for gas lines) and not the white plumber type on the threaded connection. A: Threaded valve will work. If you have one at hand you can use it. Again - YELLOW teflon tape on the thread or glue. There is not much to be gained by using a threaded connection - the design will not allow for easy disassembly anyway - you cant rotate the pressure vessel to unscrew it because of the shrader valve and the pressure gauge. Also, the thread could leak. I've seen other people using the threaded valve so I guess is OK. Personally, I am more comfortable with glued connection in the high-pressure part - it is proven strong. Wow! I work with Rain Bird DV valves every single day. That's certainly a way of using them I've never seen before. Awesome, though! LOL. Много ви благодаря за споделената информация!